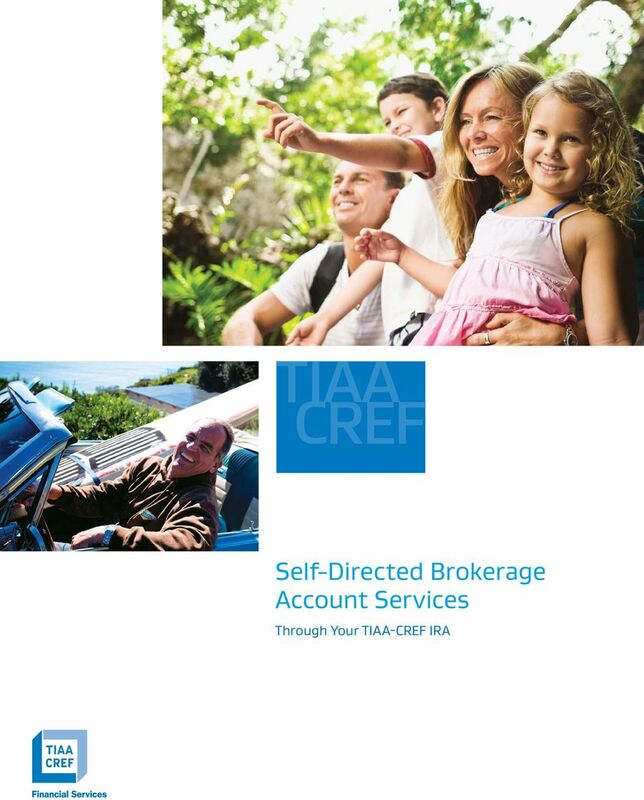 Download "Self-Directed Brokerage Account Services"
2 Power up your TIAA-CREF IRA with more. A no-fee TIAA-CREF IRA 1 is a great way to help build financial security for your retirement. It provides a powerful combination of advantages that are hard to find in the financial services world today: long-term investment performance, 2 a history of seeking long-term consistent growth, diversified investment options, personalized advice, and guaranteed lifetime income options 3 all at some of the most competitive fees in the financial services industry. 4 When you combine it with a TIAA-CREF Self-Directed Brokerage Services Account, you boost the ways your IRA can help you build your future your way. 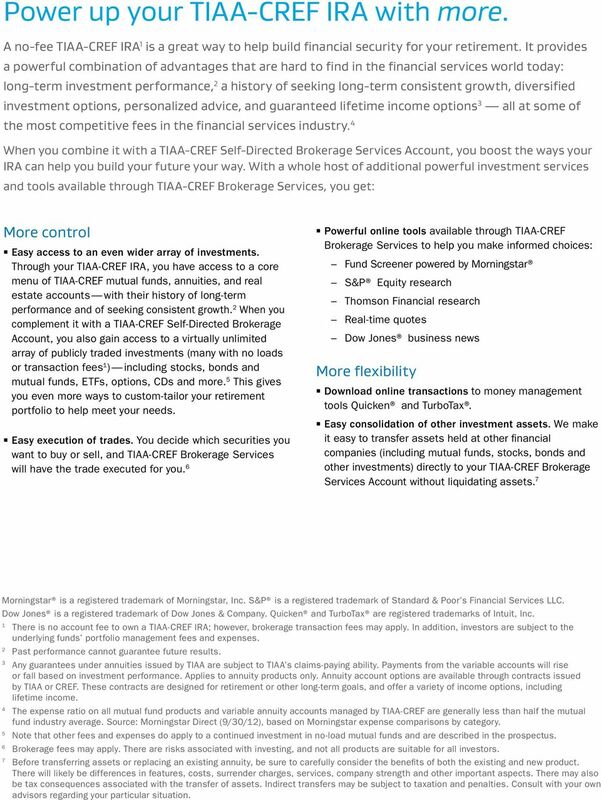 With a whole host of additional powerful investment services and tools available through TIAA-CREF Brokerage Services, you get: More control W W Easy access to an even wider array of investments. Through your TIAA-CREF IRA, you have access to a core menu of TIAA-CREF mutual funds, annuities, and real estate accounts with their history of long-term performance and of seeking consistent growth. 2 When you complement it with a TIAA-CREF Self-Directed Brokerage Account, you also gain access to a virtually unlimited array of publicly traded investments (many with no loads or transaction fees 1 ) including stocks, bonds and mutual funds, ETFs, options, CDs and more. 5 This gives you even more ways to custom-tailor your retirement portfolio to help meet your needs. W W Easy execution of trades. You decide which securities you want to buy or sell, and TIAA-CREF Brokerage Services will have the trade executed for you. 6 W W Powerful online tools available through TIAA-CREF Brokerage Services to help you make informed choices: Fund Screener powered by Morningstar S&P Equity research Thomson Financial research Real-time quotes Dow Jones business news More flexibility W W Download online transactions to money management tools Quicken and TurboTax. W W Easy consolidation of other investment assets. We make it easy to transfer assets held at other financial companies (including mutual funds, stocks, bonds and other investments) directly to your TIAA-CREF Brokerage Services Account without liquidating assets. 7 Morningstar is a registered trademark of Morningstar, Inc. S&P is a registered trademark of Standard & Poor s Financial Services LLC. Dow Jones is a registered trademark of Dow Jones & Company. Quicken and TurboTax are registered trademarks of Intuit, Inc. 1 There is no account fee to own a TIAA-CREF IRA; however, brokerage transaction fees may apply. In addition, investors are subject to the underlying funds portfolio management fees and expenses. 2 Past performance cannot guarantee future results. 3 Any guarantees under annuities issued by TIAA are subject to TIAA s claims-paying ability. Payments from the variable accounts will rise or fall based on investment performance. Applies to annuity products only. Annuity account options are available through contracts issued by TIAA or CREF. These contracts are designed for retirement or other long-term goals, and offer a variety of income options, including lifetime income. 4 The expense ratio on all mutual fund products and variable annuity accounts managed by TIAA-CREF are generally less than half the mutual fund industry average. Source: Morningstar Direct (9/30/12), based on Morningstar expense comparisons by category. 5 Note that other fees and expenses do apply to a continued investment in no-load mutual funds and are described in the prospectus. 6 Brokerage fees may apply. There are risks associated with investing, and not all products are suitable for all investors. 7 Before transferring assets or replacing an existing annuity, be sure to carefully consider the benefits of both the existing and new product. There will likely be differences in features, costs, surrender charges, services, company strength and other important aspects. There may also be tax consequences associated with the transfer of assets. Indirect transfers may be subject to taxation and penalties. Consult with your own advisors regarding your particular situation. 3 Build confidence in your retirement. 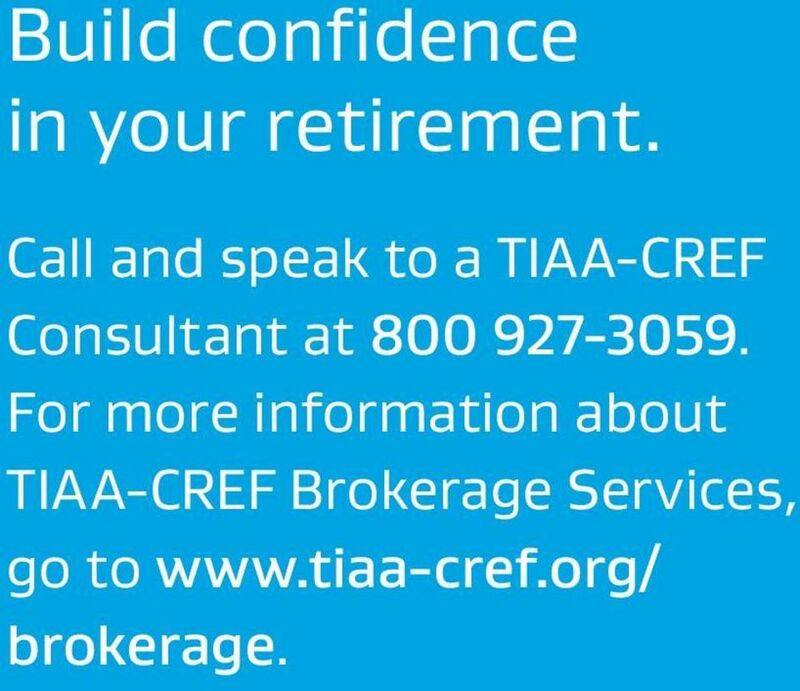 Call and speak to a TIAA-CREF Consultant at For more information about TIAA-CREF Brokerage Services, go to brokerage. 4 Benefits of combining your IRA with Self-Directed Brokerage Services Here s a quick look at the powerful combined benefits you get by coupling a Self-Directed Brokerage Services Account with a TIAA-CREF IRA. 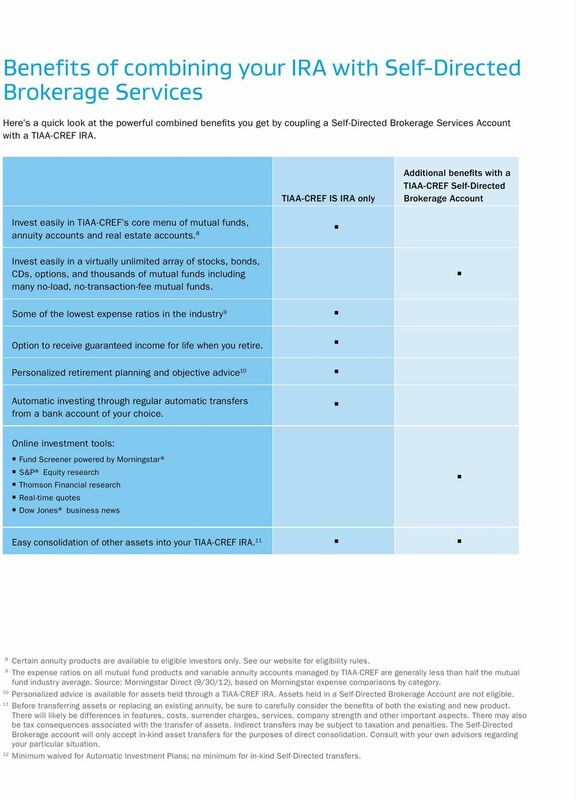 TIAA-CREF IS IRA only Additional benefits with a TIAA-CREF Self-Directed Brokerage Account Invest easily in TIAA-CREF s core menu of mutual funds, annuity accounts and real estate accounts. 8 Invest easily in a virtually unlimited array of stocks, bonds, CDs, options, and thousands of mutual funds including many no-load, no-transaction-fee mutual funds. Some of the lowest expense ratios in the industry 9 Option to receive guaranteed income for life when you retire. Personalized retirement planning and objective advice 10 Automatic investing through regular automatic transfers from a bank account of your choice. Online investment tools: W W Fund Screener powered by Morningstar WW S&P Equity research W W Thomson Financial research WW Real-time quotes WW Dow Jones business news Easy consolidation of other assets into your TIAA-CREF IRA Certain annuity products are available to eligible investors only. See our website for eligibility rules. 9 The expense ratios on all mutual fund products and variable annuity accounts managed by TIAA-CREF are generally less than half the mutual fund industry average. Source: Morningstar Direct (9/30/12), based on Morningstar expense comparisons by category. 10 Personalized advice is available for assets held through a TIAA-CREF IRA. Assets held in a Self-Directed Brokerage Account are not eligible. 11 Before transferring assets or replacing an existing annuity, be sure to carefully consider the benefits of both the existing and new product. There will likely be differences in features, costs, surrender charges, services, company strength and other important aspects. There may also be tax consequences associated with the transfer of assets. Indirect transfers may be subject to taxation and penalties. The Self-Directed Brokerage account will only accept in-kind asset transfers for the purposes of direct consolidation. Consult with your own advisors regarding your particular situation. 12 Minimum waived for Automatic Investment Plans; no minimum for in-kind Self-Directed transfers. 5 Frequently asked questions How do I open a Self-Directed Brokerage Services Account? Call us at and we will be happy to walk you through it. If you would prefer to do it on your own and you already have a sign-up kit, use the appropriate forms to establish your account. Is there a minimum required to open the Self-directed account for the IRA? $5,000 minimum opening balance requirement applies. Subsequent transactions need to be a minimum of $1,000 each. 12 The minimum investment applies only to the Self-Directed Brokerage Account portion, not to your IRA. Are any fees associated with a Self- Directed Brokerage Account? There is no account annual maintenance fee to own a TIAA-CREF IRA; however, brokerage transaction fees may apply. In addition, investors are subject to the underlying funds portfolio management fees and expenses. Refer to the customer agreement or go to for the full fee and commission schedule. Where can I get more information about what TIAA-CREF Brokerage Services has to offer? Go to to learn more. Who can I speak to if I have questions or need help opening my account? Call and speak to a TIAA-CREF Financial Consultant. He or she will be happy to help you. Given a constantly changing tax environment, what s the most effective way to save for retirement? Flexible technology TO DELIVER online brokerage services TO YOUR CLIENTS Traditional business models are evolving and the need to provide the convenience that investors demand is more important than ever. Best practices for confident plan compliance Ongoing efforts to expand retirement plan participation, promote transparency and enhance benefit security have increased responsibilities for plan sponsors. 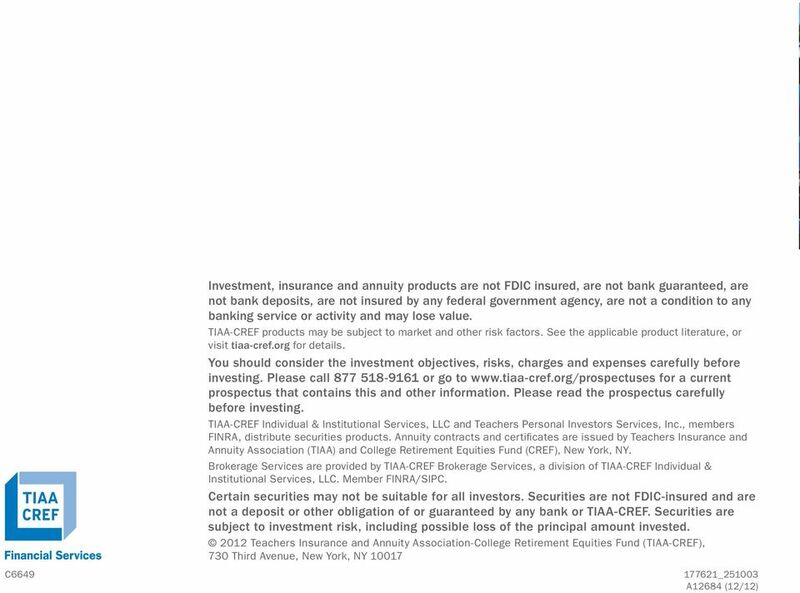 TIAA-CREF Asset Management. TIAA-CREF Lifecycle Funds. A distinctive combination of benefits for plan sponsors and employees. OPEN YOUR DEFERRED COMPENSATION ACCOUNT INSTRUCTIONS NEED HELP? Call 800 TIAA-CREF (800 842-2273) Monday to Friday from 8 a.m. to 10 p.m., and Saturday from 9 a.m. to 6 p.m. (ET) or visit tiaa-cref.org.